In ancient time African art was considered primitive and less intelligent by outsiders who misunderstood the African people’s way of life and the things they created. The African people’s way of life inspired them to create mostly what was functional and they identified themselves with their work as it enhanced their pride in who they really are. Their work, naturally sculptural, brought incorrect perception from the non-Africans who found them either barbaric or strange in form as well as their spirituality. Present day artists are emerging as some of the most important contemporary forms — often of a secular, urban, international character. But the earlier treatment of African art as if it were the static product of an idyllic past has made it difficult for contemporary African art to receive its deserved share of significance. Some works of art were considered to be authentic and called “traditional”, which is a contrast with more contemporary art, which has been deemed to be tainted by contact with other cultures. The phrase “traditional African art” helps perpetuate this unfortunate stereotyping. Although most African traditions show marked continuity with the past, it is also clear that they have not stayed the same. They have evolved, often in response to stimuli from the outside. Influences leading to change have always flowed back and forth among African peoples. Technologies, products, and ideas from beyond Africa have also been assimilated over the centuries; in fact, very little African art has not been so affected. This is the contrast between the past and the present that is currently on spotlight at Gallery Delta Foundation for Art and the Humanities in a show themed “Art and Artifacts”. An array of immaculate past traditional artifacts from local Dendera Gallery’s collection varying from such countries as Cote d’Ivoire, Ghana, Democratic Republic of Congo, Nigeria, Kenya, Mali, Cameroon, Gabon, Guinea, Liberia and Zimbabwe portray part of the rich African cultural heritage. The pieces include a five part series of the “Fetish for the protection of the home” from northern Nigeria; three part series of “Dan Spoon”, “Ram Mask”, “Senufo Bird”, “Fire Mask”, “Dancing Brush” and “Colonial Footballer” from Cote d’Ivoire. 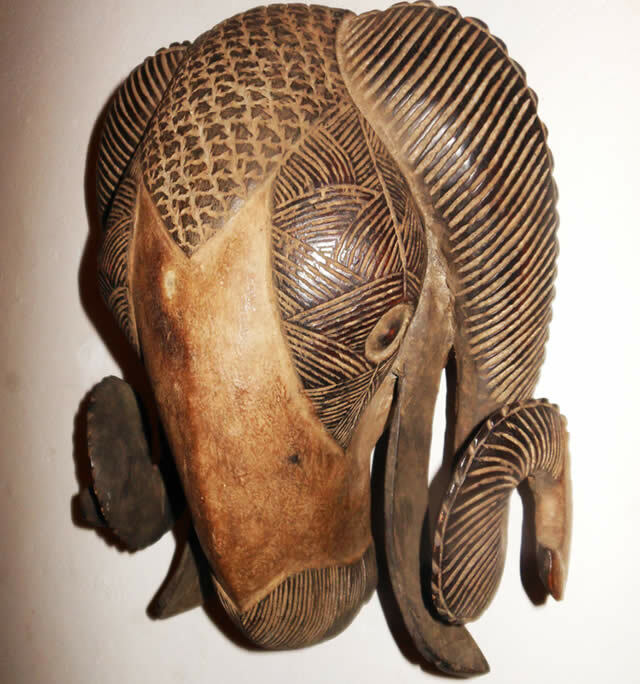 There are double series of “Woven Beer Strainer’” triple series of “Currency Blade”, “Bateke Mask”, “Bed” and “Ceremonial Staff” from the DRC as well as “Baga Serpent Mask”of spirit of the waters from Guinea. Also on show is “Bakota”reliquary guard from Gabon; “Ghanaian Gong” and “Ewe Kente cloth” of Ghana and “Dogon Horse”from Mali. “Bird Mask” from Liberia is also on show together with “GiriamaFuneral Post” and “Turkana Metal Shield” from Kenya. At the showcase, Zimbabwe presents a double set of “Binga Baskets”, a double set of “Tonga Stools”, a “Tonga Chair” and “Beer Pot” of the Eastern Highlands. The show, sponsored by the Embassy of Switzerland, has a select of local participants who were invited to view the collection of traditional artifacts at Dendera Gallery for stimulation to interpret and create contemporary works. They created the best possible of the scenario using more modern techniques and materials, leaving the viewer gratified. The artists include Thakor Patel, Greg Shaw, Cosmos Shiridzinomwa, Misheck Masamvu, Albert Wachi, Masimba Hwati, Admire Kamudzengerere and Marjorie Wallace. Wallen Mapondera, Munyaradzi Mugorosa, Victor Nyakauro, Helen Lieros and Vimbainashe Mangoma are also taking part. The exhibition seeks to reflect the artists’ individual and creative approach in interpreting their choice of artifacts in a contemporary manner. “Morph” by multifaceted artist, Masimba Hwati sees a retired knee high genuine black leather shoeless boot, getting a new lease of life off somebody’s stinking sweaty feet and scratches from rock hard toe nails. It lays backward changing smoothly and gradually from one form to another with its calf area resting on an attached pair of brand-new crimson rollers of roller skates, with the back tip of the heel touching the ground. Various crafted multi-brown wooden structures have been carefully constructed inside the boot, drilled to permit through various lengths of new five millimetre bolts. Double perfect leather circle pieces have been cut-off on either side of the high of the boot, held inches away and directly from their positions of origin by extending lengthy bolts tightened by sparkling tiny nuts. Only a single circular leather cut-off has been bolt lifted from the foot — toe area, exposing the corresponding crafted wooden bit inside that allows a six inch — five millimetre bolt to come through beyond the sole. Other tiny holes and a larger one have been left unoccupied on the leather presumably to allow the continuation metamorphosis nature of the piece. Undisputedly, the piece brings to the fore the sharp contrast between the now and before. Other pieces by the local contemporaries include “Sacrificial Goat” by Admire Kamudzengerere, “Madzimambo” by VimbainasheMangoma, “Whistling I and II” by Wallen Mapondera, “Copy That” by Misheck Masamvu, “Chidziviso” by Munyaradzi Mugorosa, “Chigwaya” by Victor Nyakauro and “Drum Guitar” by Albert Wachi to mention a few. The show is at ‘Robert Paul’s Old House’ on 110 Livingston Avenue, Greenwood Park in Harare shuts its doors to the public in mid-October 2015.